You need a blog. There are no two ways about it. B2B marketers get 67% more leads. Websites have 434% more indexed pages. Blogging will increase your visibility in search engines, drive traffic to your site, help build your email list, and convert visitors into customers. 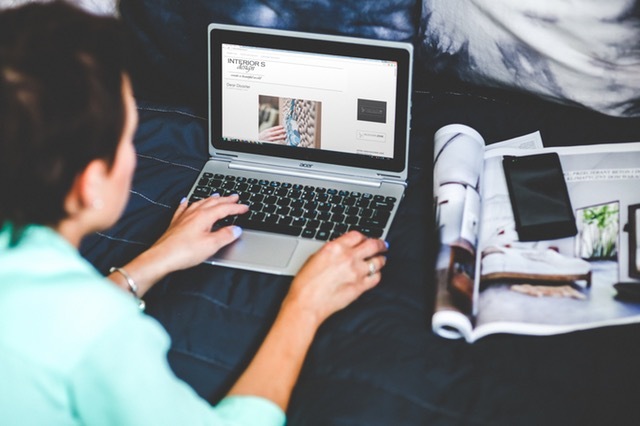 Here is a five-step process on how you can use blogging to run a successful online business. I’m not talking about your audiences’ demographics, psychographics, and online reading habits. I’m talking about what consumers search to find content in search engines. Did you know that long tail keywords account for 70% of search traffic? Long tail keywords are those three-to-four keywords phrases specific to what you’re selling. If they’re using such a specific search phrase, they know what they want, and are in the market to buy. Consider “Red Nike Shoes” vs. “shoes”. It would be wise to create content for this market, and it starts by conducting keyword research. Now, you may be thinking, “How do I conduct keyword research?”. 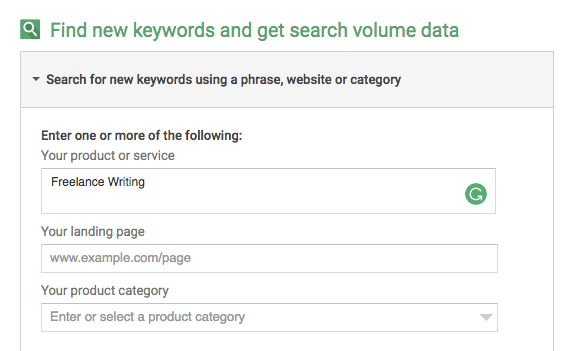 The simple answer is you use Google’s Keyword Planner. 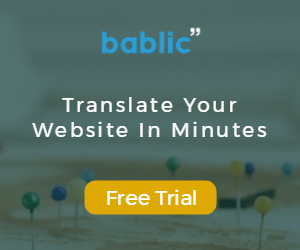 Conducting keyword research with this tool is simple. If someone like myself who isn’t an SEO expert has learned to do it, so can you. 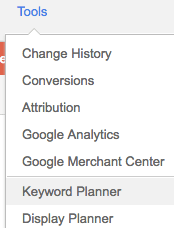 If you already have a Google AdWords Account, skip this step. If not, create a Google AdWords Account to start using the tool. 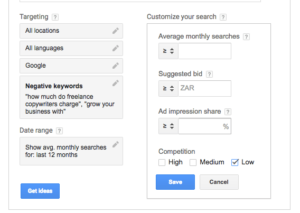 Once created, AdWords will prompt you to create an ad. Create the ad and then pause the campaign in your campaign editors, so that you don’t have to pay money for the ad. Head over to the Keyword tool, accessible via the header under tools. Step 4: Start searching for ideas in your industry. In the top box type in your business category/industry. In this example, I typed “Freelance Writing”. Select low competition and click “save”. There are other filtering options like keywords per country. These are useful for targeting specific countries. When you’re happy click, “Get Ideas”. Immediately, I’m presented with a long tail keyword, “freelance writing gigs”. What’s even better, is that there’s quite a high volume of average monthly searches and low competition. Jackpot! Rinse and repeat until you have a list of keywords you want to rank for. 1. 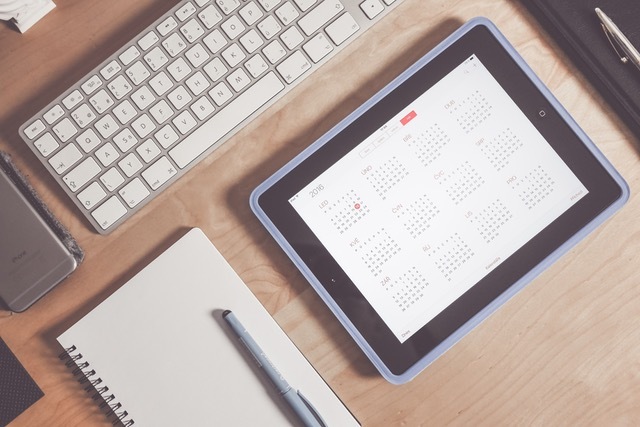 Write down a list of at least 20 blog posts for the upcoming months. If you’re struggling with ideas, download six months worth of content ideas from ProBlogger. It’s free. 2. Create a content calendar in Excel. Read this article on Convince and Convert to learn more: How to Build a Content Calendar (Plus a Free Template). 3. Base the majority of your posts on long-tail keywords. For example, using “freelance writing gigs”, I could write a post titled, “20 Places to Find High-Paying Freelance Writing Gigs Online”. 4. Decide on a posting schedule and stick to it e.g. once, twice or even four times a week. Factor in your available time and resources. 5. Be patient. Most people fail because they don’t see results fast enough. There’s no magic bullet. Ranking in search engines takes time. 6. Diversify your content. Use videos, infographics, and blog posts. Here is a great article by Neil Patel on the topic: How to Use Multiple Content Formats to Diversify Your Traffic. 7. Tap into the networks of established blogs and influencers. Read this article on Smart Blogger: Blogger Outreach: How to get Influencers to Promote Your Content For Free. It doesn’t help writing for the sake of writing. If you want to run a successful online business, your blog posts must be well-written, information rich, and help your readers. 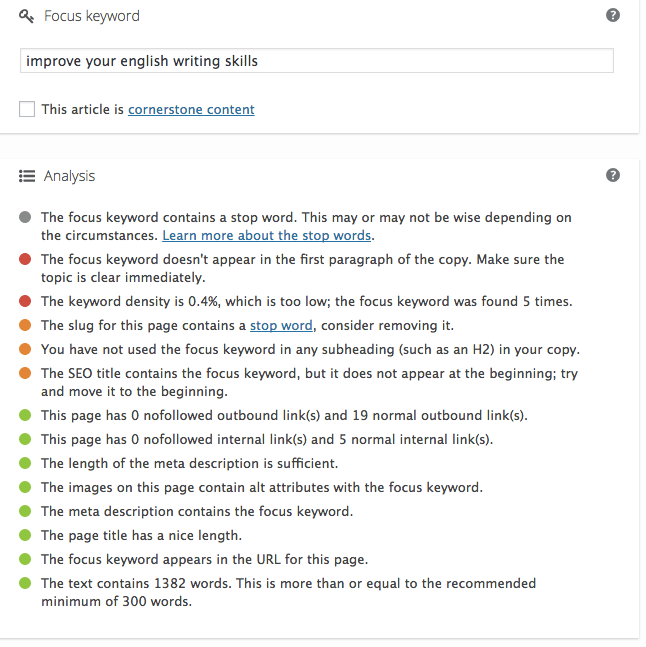 For example, in this post I didn’t tell you how to conduct keyword research, I showed you. Using this approach will stand you in good stead as you attempt to run a successful online business. “How to” articles are often a good place to start. These headlines get a lot of click-throughs. If the topic interests them, they’ll click on it to learn more. Also, start using long form content (2000 words or more). According to research performed by Serpiq the average length of content in the top ten results of search engines is 2000 words or more. Read the following article by Neil Patel to learn more: Why 3000+ Word Blog Posts Get More Traffic (A Data-Driven Answer). Writing great content for people is important, but if you want to succeed online, you also need to write for search engines. Optimize your blog posts with those long-tail keywords and make sure your keyword is in the title, slug, meta tag and alt attributes of your images. If possible try and sprinkle the keyword in your post a few times. But, avoid keyword stuffing (Google sees excessive use of Keywords as spam). Try to make all line items green. Do take note that it’s only a guideline and it’s not always possible to get all line items green. Read this article on Duct Tape Marketing to learn more: 7 Steps to Optimize Your Blog Posts Like a Pro. 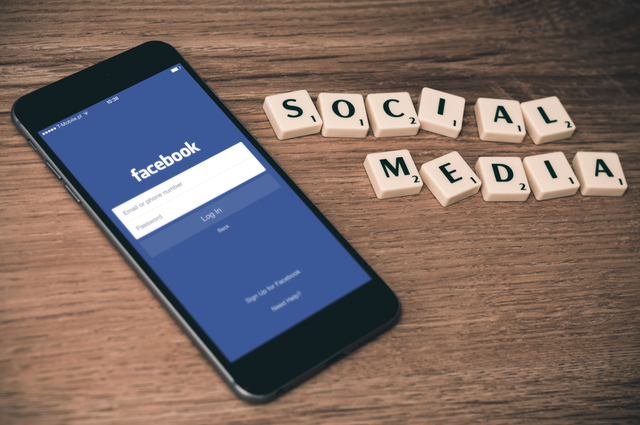 The final step to using blogging to run a successful online business is to share your posts across social media. Also to simplify your efforts use social media automation tools like the Buffer. It’ll help you to create a social media posting schedule in advance. 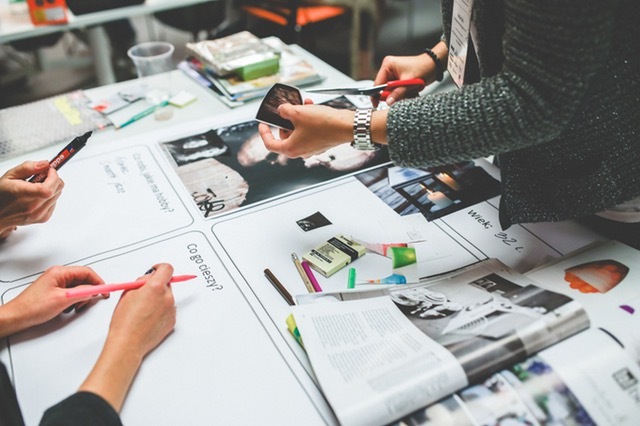 Creating an online business is easier than it’s ever been. But running a successful one is a different kettle of fish. But, by blogging and following these five steps you’ll be well on your way to success.